A laser pointer is designed to project a bright spot of colored light onto something you are interested, thus making it easily visible. 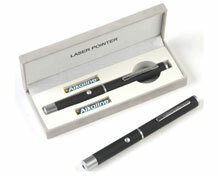 Laser pointers are used in many applications, typically, in visual demonstrations, educational and business presentations. There are many types of laser pointers on the market today, such as red laser pointer, yellow laser point, and green laser pointer etc. As an ISO9001:2000 certified laser pointer manufacturer and supplier in China, we at Deli Stationery have been committed to providing high quality products to customers worldwide. To meet different needs of our customers, we also offer other office supplies such as utility knife, scissors, cutting mat, pencil sharpener, pen stand, ruler, etc., in addition to laser pointers. These products are not only reliable, durable, but also aesthetic. Whenever you have a need for our products, please feel free to contact us! We are confident our products will meet your expectations.